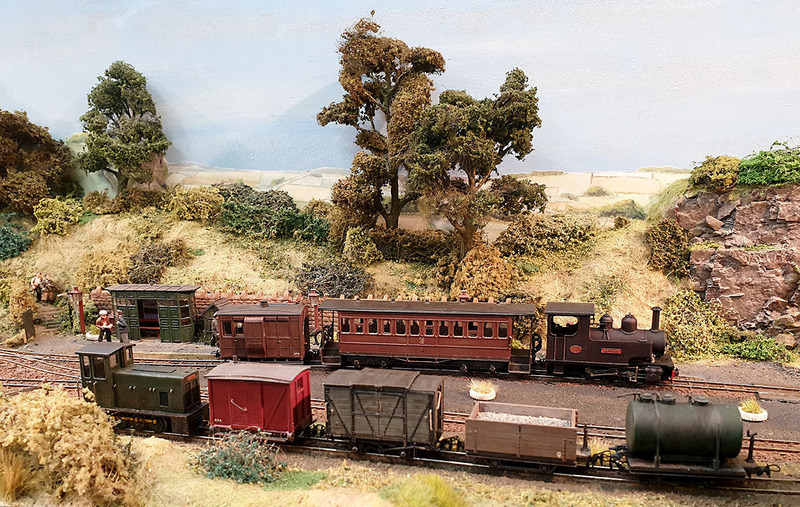 On Saturday the Cambridge Model Railway Club held their exhibition. There were lots of layouts and an excellent selection of traders. Best of all it is only six minutes from my house by bike, most of that on cycle paths. How nice to cycle to a model railaway exhibition! 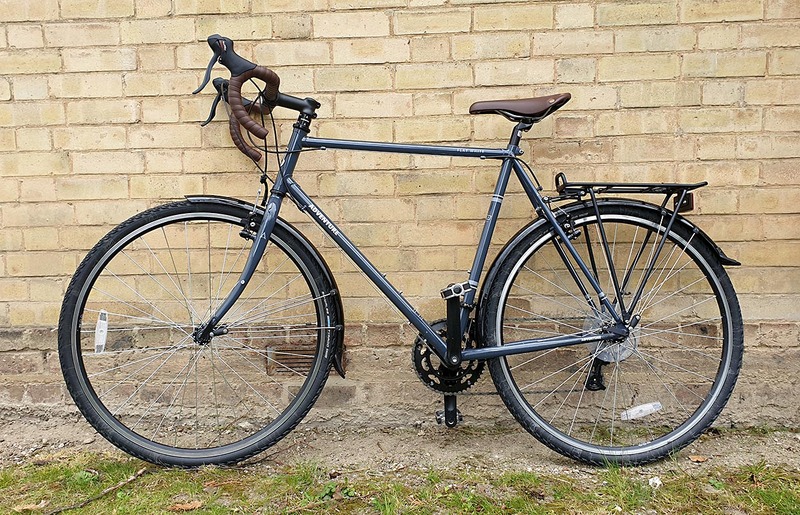 It gave me a good excuse to use my new ‘go anywhere, leave anywhere’ bike. Enough distractions, let’s get to the trains. 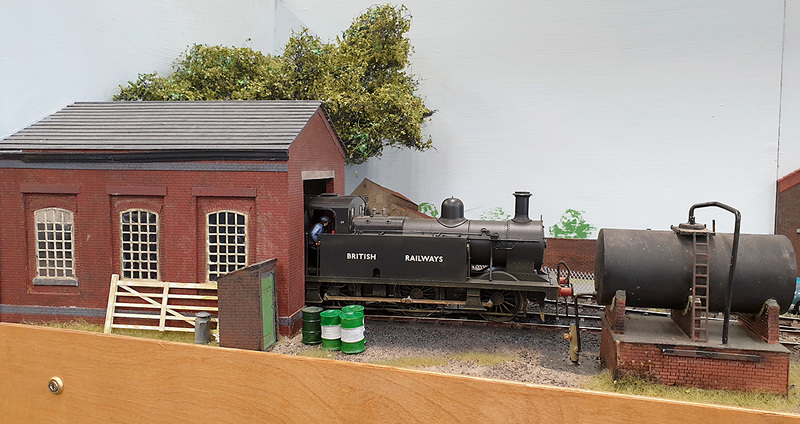 It was a pleasure to see Scale Bob Vaughan’s Tansey Bank & Hobbs Row Halt OO9 layout again. 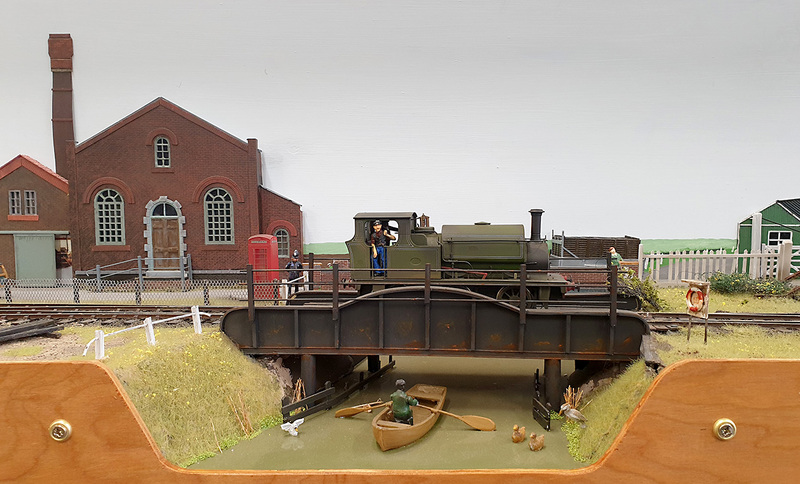 It represents the main terminal station and engine shed on a preserved ex-industrial railway somewhere around Warwickshire in the early 1960’s. 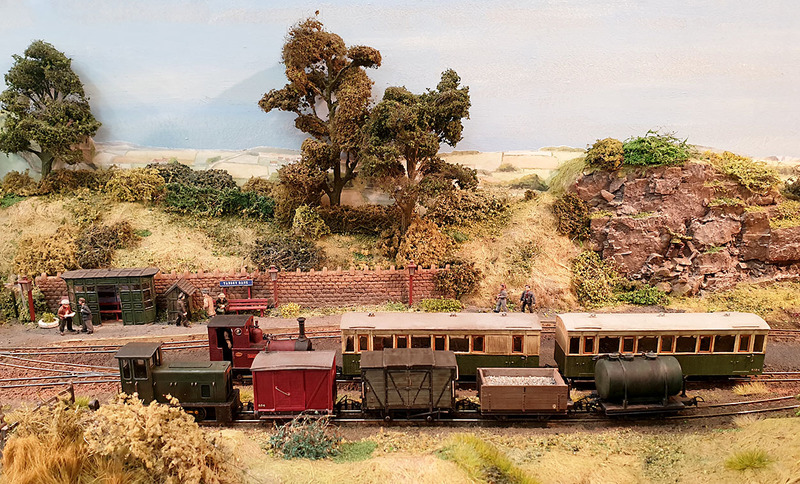 The layout started out as a simple circular test track and has developed into a classic English country micro-layout, complete with thatched cottage and “chocolate box” garden. 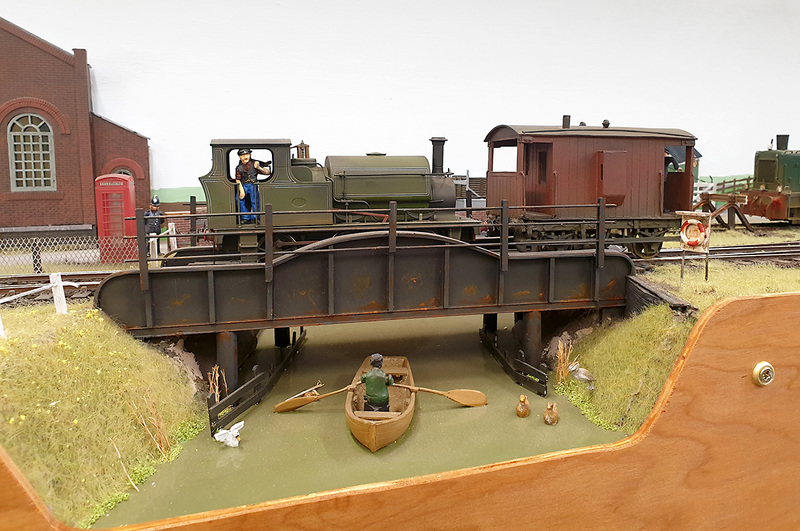 There were a number of very nice O scale layouts, and I found I was drawn to them. This is Fleebight Wharf by Terry Cooke. A small and cramped service facility in the heart of London’s dockland that is a sub shed of 30A Stratford. It allows refuelling and minor repairs to be carried out on the diesel shunters that operated in the numerous yards and transfer sidings that abounded in that area. Terry had a lovely collection of green livery 08 shunters. Hungate Sidings by Robert Murfitt represents a branch line somewhere on the Norfolk / Cambridgeshire border as it might have been in the late 1960s. The branch line has closed beyond this point but has remained open to the sidings in order to serve a nearby sugar beet refining factory. The bridge scene was very attractive and I took a few photos of it. Robert’s locos were very nicely weathered using an air brush. He pointed out that people often forget to turn the wheels when weathering locos. If you don’t do this, the coupling rods will mask parts of the wheels leading to unweathered areas. Robert had a nicely weathered green liveried 08 class. Perhaps this is the loco of the day. Or perhaps Dapol are selling lots of them! The highlight of the show, for me, was 4000 Yards – Area 5 by Kelvin Barnes. 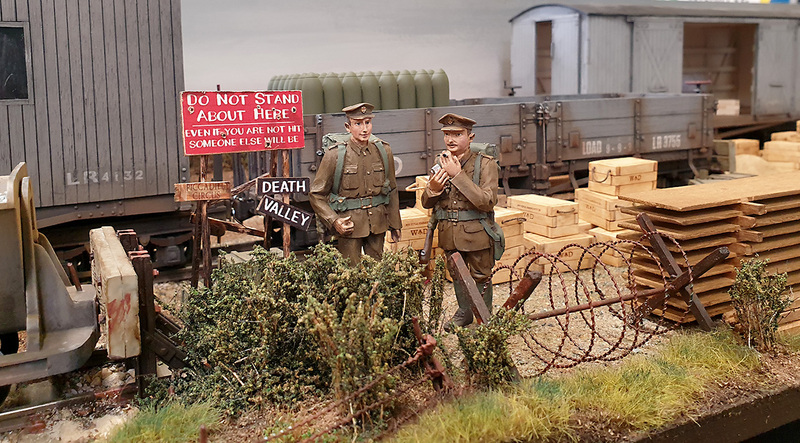 This 16mm scale layout represents the World War 1 two foot gauge lines that served supply depots. Situated 4000 yards from the front this was the nearest a light railway was allowed to run from the front line. The locomotives running the WW1 supply trains were often small petrol engines. Kelvin had lovely models of the unarmoured Simplex (above) and an armoured ‘Tin Turtle’ version (below). 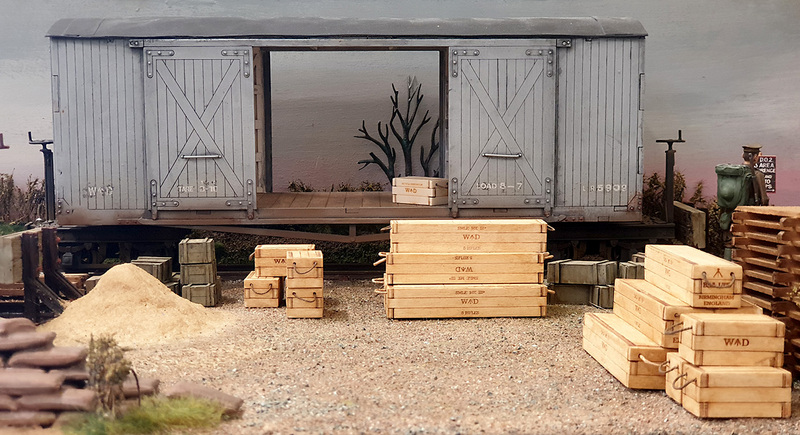 The layout features some very well modelled, highly detailed scenes. See the image at the beginning of the blog for an example. Kelvin has created an interesting overview of the supply area. And the scenes merit a closer look too. The layout design is very simple. Three lines of track linked by a traverser. 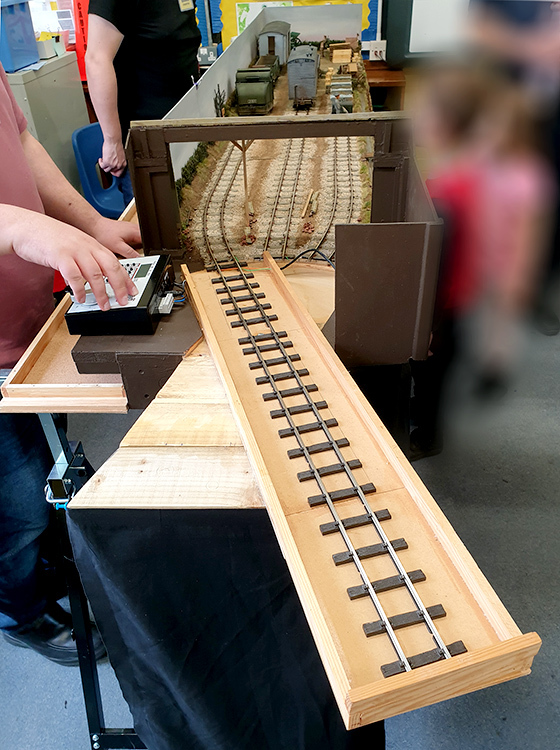 The simplicity really helped the team to ‘keep something moving’ and the layout was very popular with visitors. I was tempted by the traders. The Model Scenery Supplies team were very helpful and I went home with some industrial backscenes and some model cows. These will not be used on the same layout!